The problem is, when I open applications I need to always right click, select run as admin. When I don't do it getting unexpected application errors. BTW, I turned off UAC. Right-click the shortcut, click Properties. Click Advanced. Select Run as Administrator. Go to the location of the executable. Right click AppThatRequiresAdminRights.exe and select Troubleshoot compatibility. Select the option Troubleshoot program after the wizard has finished detecting issues. Choose the The program requires additional permissions option. The wizard will apply the Run as Administrator setting to AppThatRequiresAdminRights.exe program. Click Test the program (required) and close the wizard. Set-ItemProperty -Path "HKLM:\Software\Microsoft\Windows\CurrentVersion\Policies\System" -Name "EnableLUA" -Value "0"
entering on the PowerShell (started as administrator) did it for me without specifying something for every single application. Please note that this does permanently disable UAC. Dragging the slider down in the UAC settings will not disable the UAC completely, it just won't prompt anymore but still remains active. Kill all Explorer instances and then start it again through Task Manager (Ctrl+Shift+Esc) with administrative rights. Use the good old Task scheduler trick which works since Vista. I wrote a simple tool to solve this problem. 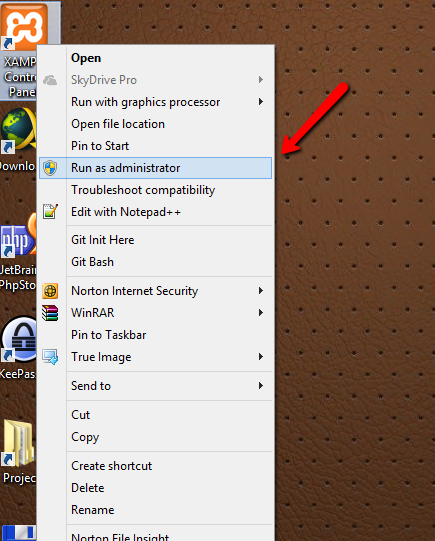 Read more in my CodeProject article Run Windows 8 Applications as Administrator by Default. for %%i in (%*) do reg add "HKCU\Software\Microsoft\Windows NT\CurrentVersion\AppCompatFlags\Layers" /v %%i /d  "~ RUNASADMIN"
Search for CMD in start menu and run it as administrator and enter the following command. Not the answer you're looking for? Browse other questions tagged windows uac or ask your own question. How can I run Process explorer ALWAYS as Administrator? Why does UAC still prompt me when “Run as Administrator” is permanently set? Is a Separate Administrator Account Necessary in Windows 7? Does “run as administrator” on Windows 10 always use the same access token?